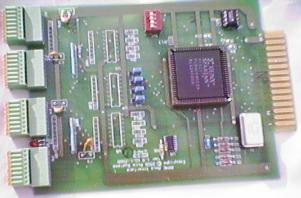 This board is a 4-channel 24-bit Quadrature Encoder Counter. It counts all transitions of quadrature encoders with a 24-bit signed binary counter. Control is through a bi-directional parallel port, with signals connected via the PPMC motherboard. The board has a 4-position DIP switch to set the range of addresses the board responds to. It occupies a block of 16 Byte addresses. This allows more than one encoder board to be used in a system, to obtain more than 4 axes of closed-loop motion control. Additional logic is provided to read an index or zero reference channel along with the encoder quadrature signals. This signal sets a register bit when a low-to-high transition is detected. There is a 24-bit preset register that can be used to preset one (or all) counters to a specific value.